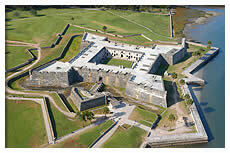 St. Augustine, Florida & Historic Tours of America -- Premier St. Augustine sightseeing tours & attractions. Visit the oldest city in the United States and get your dose of warm Florida sun and fascinating history. St. Augustine is known for its gorgeous sandy beaches, breathtaking architecture, antiquated buildings and its significance to the shaping of our nation. 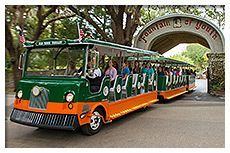 When you climb on board Old Town Trolley Tours of St. Augustine, you’ll have a chance to see the Ancient City in all its glory, from historical attractions like the site where Ponce de Leon first landed ashore, to unique attractions like the Alligator Farm. During the 90-minute tour, you’ll have the opportunity to get off and on the trolley as often as you wish, giving you a chance to stay at any of the stops for as long as you want. Our local conductors make the tour even more entertaining by providing history and humor all rolled into one. Our conductors are recognized for their ability to captivate and entertain each of our guests. Local residents who come from various cities around the U.S., they share a common enthusiasm for history and talent to amuse folks. You’ll learn about the first settlers to the city and the powerful Spanish influence that still exists today. You’ll see the Castillo de San Marcos Fort that guarded the city against foreign invaders and is the oldest European fort of its kind still standing. From museums to architectural masterpieces like The Ponce de Leon Hotel, now Flagler College, to the oldest wooden schoolhouse, you’ll see it all on the orange and green trolleys. 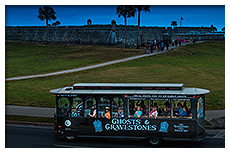 Only Old Town Trolley Tours of St. Augustine offers the best of the city in one delightful tour. 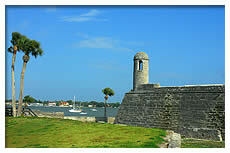 St. Augustine was founded by the Spanish under Admiral Pedro Menéndez de Avilés in 1565. 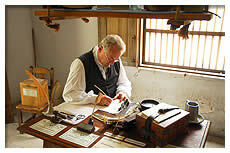 Learn more information about St. Augustine Tours. On the Ghosts & Gravestones tour you will pass by some of the scariest and most sacred sites including the Huguenot Cemetery, the final resting place of the victims of yellow fever…or was it final? Some visitors to the burial grounds have reported seeing eerie apparitions and translucent orbs floating about. 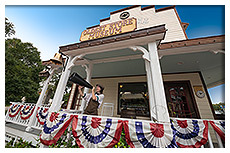 Built on the edge of the Tolomato Cemetery sits one of St. Augustine’s most recognizable buildings, the Old Drug Store. Unexplained noises, cold spots and shadows reportedly moving on their own make up only a few of the hundreds of documented supernatural occurrences. Learn the secrets to these hauntings that have plagued the Old Drug Store from the time it first opened in 1887. Afterwards get an exclusive nighttime experience inside Potter’s Wax Museum’s Chamber of Horrors for a unique retelling of the famed pirate Andrew Ransom’s gruesome execution. In addition to being a national tourist destination and the continental United States' oldest city settled by Europeans, St. Augustine was also a pivotal site for the civil rights movement in 1963 and 1964. Gain a greater understanding of the evolution of Florida, the people who helped shape its future and the rich past that it represents at the St. Augustine History Museum. Stroll through a myriad of displays and exhibits to learn how four different nations ruled over this quaint beach town and how each one made an indelible mark on its culture and personality. In the St. Augustine History Museum, a Spanish treasure room showcases a magnificent collection of items found on actual sunken ships. A Timucuan Indian Village and Florida Cracker trading post provide an up-close look at how the earliest settlers lived and made a living. Visitors will learn the amazing facts about the different periods of St. Augustine’s history where the British, Spanish and French dominated the city and how it came to be a part of the United States of America. 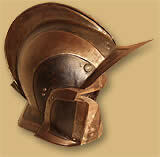 More than four centuries of war, government and heritage are featured throughout the museum’s various displays. Discover Henry Flagler’s undeniable influence upon the city, from his stunning architectural masterpieces that still stand throughout St. Augustine, to his historic triumphs in the railroad industry. 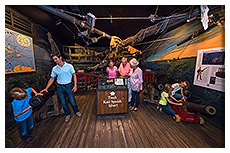 The St. Augustine History Museum is an ideal stop for guests of any age - an educational and enlightening experience that offers an in-depth look at Florida’s amazing history. 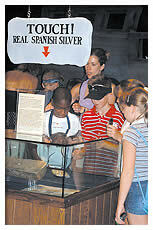 For school children, there’s no better way to learn Florida’s history than reliving it during one of our extraordinary field trips. Our educational tours offer visits to many of St. Augustine’s most significant historical sites, an assortment of choices for itineraries and much more. Bring your students to see first-hand the places you’re discussing in your history lessons. Let them witness the magnitude of the Castillo de San Marcos, the largest Spanish Fort in America and one of the few structures of its kind still in existence. They’ll enjoy a guided tour of this imposing Castillo and gain a perspective of how the soldiers during that era lived and fought to defend St. Augustine. Also included is a fully narrated Old Town Trolley Tour that showcases 100 points of interest throughout the city. And you may pick two of the following sites to visit: The Old Jail, the Oldest Store Museum Experience, the St. Augustine History Museum or Potter's Wax Museum. Our field trips can also include stops at the Oldest Wooden School House, the Fountain of Youth, The Lighthouse & Museum, Alligator Farm and more. And the best part? You can design your own adventure to suit the needs of your students—our experienced planners will assist you in customizing your excursion so it is most beneficial to you and the children. Adhering to the educational standards set forth by the state, each of our field trips is designed to bring your history curriculum to life. Each participating class will receive a 16-page activities book sent via email as a PDF file. Pre and post trip activities provide you with educational materials that also entertain. All materials were created by curriculum specialists and are based on Florida Sunshine Standards. 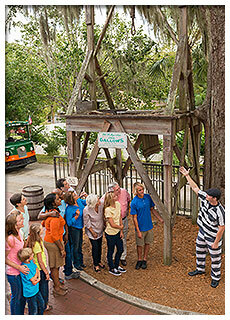 If you’re looking for an unforgettable way to teach Florida’s fascinating history, our tours are ideal. Spend a couple of hours or an entire day exploring all the glorious historical sites in the ancient city. Your students will be delighted, entertained and most importantly—enlightened! Watch in amazement as our friendly clerks, butcher and snake oil salesman demonstrate the very latest inventions for turn-of-the-century living. Meet the proprietor, Mr. C.F. Hamblen. 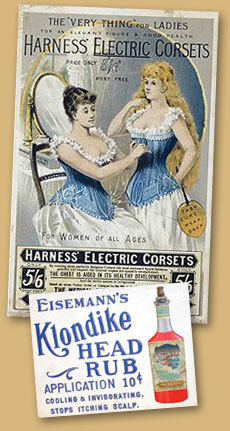 Step back in time and discover the latest and best time saving miracles from 1900! 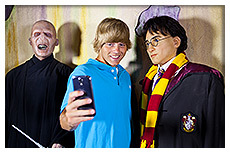 Potter’s Wax Museum is located on Orange Avenue in historic St. Augustine and offers visitors a unique opportunity to see some of the world’s most famous people up close. 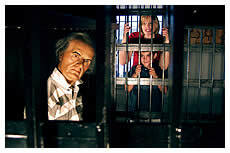 America’s first and oldest wax museum, it was founded by George Potter, a man who traveled around the world as a young child with his family. It was during one of his many trips that Potter visited a London wax museum and became inspired to create his own wax sculptures in America. Potter’s opened in 1948 and is home to more than 145 wax figures including celebrities, sports stars, dignitaries, politicians, entertainers, historical people and more. A visit to today’s Potter’s Wax Museum is as fascinating and entertaining as it was when this beloved St. Augustine attraction first opened its doors. You’ll stand next to Harry Potter, his friends Hermione and Ron and his mortal enemy, Voldemort. You’ll see Presidents Abraham Lincoln and George Washington, John Adams and others. Benjamin Franklin, Cleopatra, Ponce de Leon and Elvis are also here - along with Annie Oakley and Davy Crockett. Imagine looking Michael Jordan in the eyes and getting your picture taken next to Henry the VIII and all of his wives. Potter’s figures are known for their remarkable likeness to the characters they represent due to the process that’s used to create them. Each one is custom-tailored with real hair placed on one strand at a time. The eyes are handmade in Germany and the hands are sculpted in Belgium. Come with the family, bring your group or come on your own. Be sure to bring your camera - photography is not only allowed, it’s encouraged! 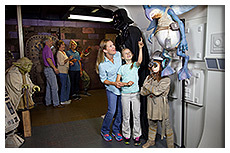 Potter’s Wax Museum welcomes groups, schools and adults and children of all ages. To learn about more St. Augustine attractions and tours provided by other Trusted Tours & Attraction Members, go to TrustedTours.com. Buy your Boston Tea Party Ships & Museum tickets online and reserve your spot today! St. Augustine things to do.